North Korean leader Kim Jong-un and his wife Ri Sol-ju have a new little daughter, according to former NBA star Dennis Rodman who recently paid a visit to the isolated country. "She kept talking about their beautiful baby daughter," Rodman told British tabloid the Sun. Ri looked pregnant in photos until mid-December of last year and noticeably thinner at a New Year concert on Jan. 1. A South Korean government source was unable to confirm the story but nonetheless speculated that doctors induced labor to make sure the child was born in 2012, which marked the 100th anniversary of North Korean founder Kim Il-sung. The National Intelligence Service said last July that Kim and his wife are believed to have children but could not say how many, how old and what gender. Is Kim Jong-un Expecting Another Child? 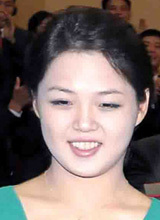 Did Kim Jong-un's Wife Have a Baby?